Big Fish Ventures app may set a competition to specialized dining and reservation app operators like Zomato, Dineout, Eazydiner and Reserveyourtable. Big Fish Ventures, a Delhi-based startup that runs premium dining lounges such as The Vault Café, The Junkyard Café, Café Public Connection, Indian dhaba restaurant Garam Dharam and Bandstand, has launched a mobile application for its customers. With this app, the customers can make reservations, loyalty point redemptions and avail promotional offers at just a click. Big Fish Ventures is planning to launch over 40 outlets across India and overseas over next 2 years. Some of the upcoming café’s are OMG – Oh My God !, Three pegs down and expansion of existing brands to other locations. The app will cater to its 60,000 customer base who frequent their restaurants every month in a better way and plans to bring over 2 lakh customers by end of 2016. The loyalty program is called Big Loyalty which enables a consumer to gain 5000 points on every download and subsequently on every billing and redeem them with exciting discounts, offers and deals exclusive to the app. In the next phase they also plan to launch a wallet which will give more value add to the customer on each spend by giving them a cash back in their wallet. The app also features a food blog which is called Big Foodie in which one can have food discussions, ask questions, exchange recipes, share experiences with top food bloggers and run contests as well. Big Fish Ventures' move may set the trend for large multi format restaurant chains developing their own apps and eventually posing competition to the specialized dining and reservation app operators like Zomato, Dineout, Eazydiner and Reserveyourtable. "We will bring over 2 lakh customers on our mobile app by end of 2016 and will be doing over 5000 table reservations per day by June 2016. We plan to invest over 3-4 million dollars over next 3 years," said Umang Tewari, Founder, Big Fish Ventures. The app will be available on Google play store and Apple Store and will provide regular update its customers about promotional activities and events at the outlets operated by Big Fish Ventures. "Most firms are focused on creating single brands with standardized formats like, for example, a McDonald's or a KFC. We are building a cluster of concept--based different brands across genres and large formats," Tewari added. 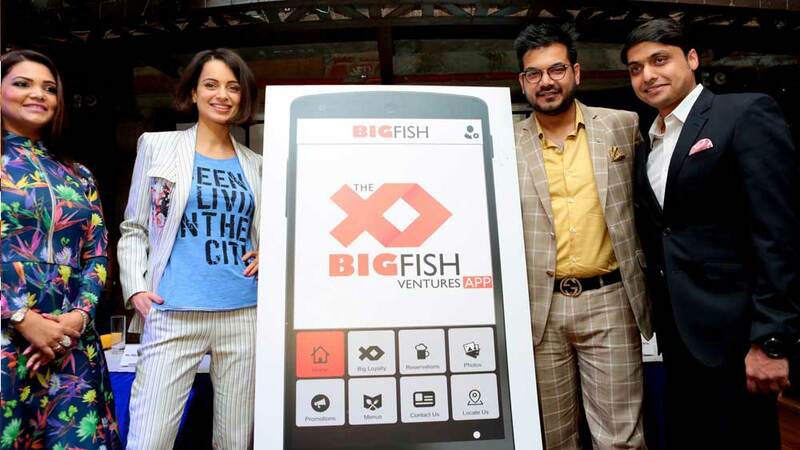 Big Fish has roped in Nishant Singhal, cofounder of Yuvraj Singh’s startup venture fund YouWeCan Ventures as its chief mentor. Singhal, who has also picked up a stake in Big Fish Venturesadvises the firm on future growth strategy. The company aims to create, build and operate over 40 outlets by FY 17-18 under brands created by them. Big Fish plans to invest over $30 mn in building and operating outlets and will clock gross sales of over $100 mn by FY 18-19. Big Fish will clock sales of over $10 mn in FY 15-16 and over $30 mn in FY 16-17. Big Fish currently employs over 500 people across restaurants and logistics and back-end space and will be employing over 1200 employees by March 2017. How important is the onsite location for any resta..